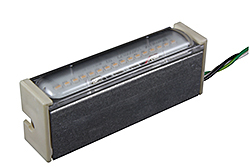 The Line Voltage Linear LED Engine is a modular product designed to retrofit luminaires, such as wall sconces, ceiling fixtures, outdoor wall packs, and recessed fixtures. Available in 4-, 6-, and 8-inch lengths, the module connects directly to line voltage and is supplied with hardware that allows an electrician to handle the upgrade in five minutes. It is UL 1598C classified, meaning an ungraded fixture retains its UL listing.